Drawing on research by Brian O’Neill (National Center for Atmospheric Research) and others Lovell explained that meeting the unmet need for family planning around the world could provide up to 16 to 29 percent of the emissions reductions required by 2050 in order to avoid more than two degrees of warming (the target set by nations to prevent the most damaging effects of climate change). For environmentalists and those concerned with climate change, “sometimes the idea has been that population is toxic, that we can’t talk about population growth,” said Nancy Belden of Belden Russonello and Stewart Consulting, but the results of a recent survey and several focus groups conducted in association with Americans for UNFPA demonstrate that there is great potential for engaging the environmental community in such a discussion. Belden and Lovell were joined by Kate Sheppard from Mother Jones to discuss how the population and environment communities can come together in the lead-up to the Rio+20 UN sustainable development conference. When we approach the linkages between environment and population, said Sheppard, it is important to recognize the role of empowering language – language about access to services, education, and resources for women. The aim of the Americans for UNFPA survey was to find out whether environmentalists can be engaged in discussions of population issues such as family planning and international voluntary contraception, and if so, how? Second, the environmental community is relatively optimistic about the potential outcomes of family planning programs and of foreign aid in general. When queried, half of the environmentalists strongly supported the idea of U.S. contributions to UN programs that provide voluntary access to contraception in developing countries, said Belden. When asked to mark their top priority among a list of possible outcomes of providing voluntary access to contraception, 47 percent of the environmentalists selected either “improving living conditions for women and their families” or “ensuring women have options and can make reproductive decisions” as their top priority. While a significant number are also concerned about stalling population growth, this integrative focus on improving the lives of women and their families is heartening, said Belden. Lovell similarly highlighted that “if we’re working to ensure a sustainable planet for future generations to come, we have to think about consumption and population.” For instance, “the United States makes up five percent of the world’s population but consumes 25 percent of the world’s resources,” she said. It is imperative – especially from a sustainable development standpoint – that while working towards integrating environment and population we remain focused on a message that includes “using less but still having a high quality of life” here at home, said Sheppard. Sources: Proceedings of the National Academy of Sciences. 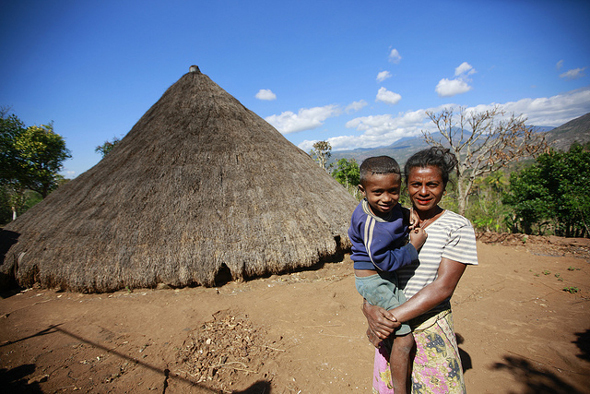 Photo Credit: “Timorese Traditional Home,” courtesy of United Nations Photo.